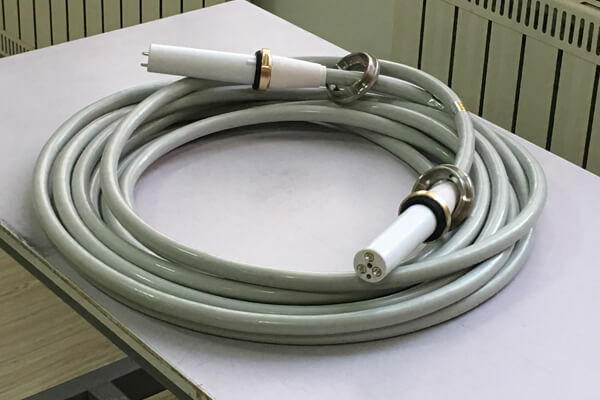 The 75kvdc high voltage cable 6m is an important part of X-ray machine, and our 75kvdc high voltage cable 6m is also equipped with a high voltage connector, which enables the cable to connect the X-ray generator with X-ray tube or other equipment. With the improvement of medical equipment automation, medical equipment electronic device has higher requirement about the quality of the input and output signals, and small medical equipment volume to more precision, more than functional units operating space and the complication, as an 75 KVDC or lack of transfer and connection medium high voltage cable 6 m, high performance, high diffusion, is increasingly demanding high elasticity. Newheek 75kvdc high voltage cable 6m is divided into 75KV and 90KV, and in accordance with federal standards, X-ray cables have various specifications of cable head and length matching. 3 or 4 core cable. Straight or curved cable. Movable flange and contact. The outer sheath adds 75kvdc high voltage cable 6m to the foaming structure. Newheek’s 75kvdc high voltage cable 6m has the characteristics of good flexibility, low noise, good high-pressure characteristic and safety margin width. Meet your different needs. Moreover, our 75kvdc high voltage cable 6m length can be customized.